I checked resale value of each gift card at giftcardgranny.com. And I decided to buy Saks Fifth Avenue, GameStop, and Sears GCs. Last week, I bought Saks Fifth Avenue GC on eBay. It was an e-code from paypal _digital_gifts. Giftcard Zen accepted e-code without reducing payment unlike ABC gift cards or Cardpool. I already sold it to them. This time, they are going to be physical GCs. So, I don’t have to worry about such things. Vanilla MasterCard GC deal is not good for me. First of all, you have to buy two cards to receive 500 Plenti points. I don’t know exactly how much a purchase fee of the smallest denomination GC is, but I believe that 500 points (=$5) won’t cover purchase fee of two GCs. If you have a credit card that offers a high reward for drugstore’s purchase, it may be worth it. Second, probably Vanilla MasterCard can’t be used for Serve reload at Walmart or even Family Dollar. In my experience, I tried to load Serve at FD, using $100 MasterCard GC from Target, and it didn’t work. Click here to see details. So, I had to use a bunch of MasterCard GCs for regular purchases. Reportedly, Walmart accepts $49.99 reload with Vanilla Visa GCs, but it’s not sure for MasterCard GCs. In general, MasterCard GCs are more problematic than Visa GCs. Earned Plenti points are used for future purchase at Rite Aid. 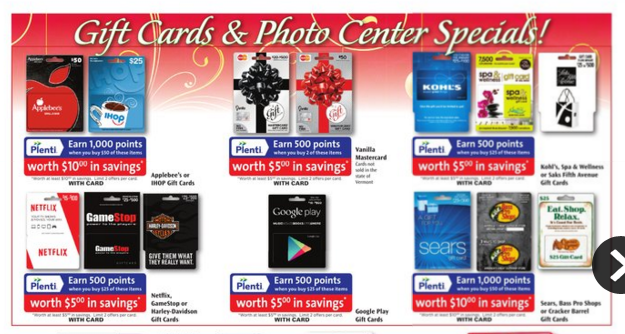 You can redeem them at Macy’s, Exxon/Mobile, and AT&T, too!